The Battle of Leyte Gulf, the largest naval engagement in history, connects the two American and two Japanese commanders covered in Sea of Thunder. Evan Thomas, assistant managing editor of Newsweek and author of other popular histories such as John Paul Jones and Robert Kennedy, uses the approach of a biased journalist rather than a professional historian to tell the stories of William Halsey and Ernest Evans on the American side and Takeo Kurita and Matome Ugaki on the Japanese side. The author not only relates their involvement in key battles in World War II but also delves into their personalities. The four men selected for this history do not hold equal ranks, so the book usually seems like four separate biographies with few interconnections rather than a comparative study of their personalities and leadership styles. Also, the four commanders do not receive equal time. Halsey and Kurita get the author's most attention, whereas Ugaki and Evans receive less consideration. Ernest Evans, commanding officer of the destroyer USS Johnston, does not even get mentioned until page 50, and he had no involvement in the strategic command decisions of the Battle of Leyte in comparison to Halsey and Kurita. Although Ugaki commanded the 1st Battleship Division during the Battle of Leyte Gulf, he reported directly to Kurita. The author has harsh criticism for Halsey and Ugaki, whereas he portrays Kurita and Evans much more sympathetically. Almost all of the book's information about Vice Admiral Ugaki comes from the excellent English translation of his extensive diary entitled Fading Victory, which covers all of World War II. Ugaki led Japan's kamikaze attacks against the American fleet during the Battle of Okinawa, and he also led 11 Suisei dive bombers in Japan's final kamikaze attack of the war after the Emperor's announcement of surrender. Thomas casts Ugaki in a negative light throughout the book, but some of his comments and colorful adjectives have little or no support. Some of the phrases that the author associates with Ugaki include the following: "man becoming unhinged," "demented bloody-mindedness," "increasingly delusional," "would deliriously report wildly exaggerated numbers," "touch of madness," and "apotheosis of the sickened, suicidal militarism that ruined Japan." Vice Admiral Ugaki believed in traditional Japanese military values (bushido) and suffered great shame when the Emperor announced surrender, but his diary does not reflect a "demented bloody-mindedness" and a "man becoming unhinged" as alleged by Thomas. Rather, the diary shows a military leader trying to do everything he can in a losing war. His decision to not lay down arms after the Emperor's message and to take several aircraft on a final kamikaze mission is quite controversial, but this action showed how resolute his belief was in Japan's traditional bushido in which defeated military leaders often took their own lives. The few sections related to Japan's kamikaze operations contain numerous errors to the point that little reliance can be placed on the information. The final paragraph on Ugaki tells how LST-296 gunners shot down several kamikaze planes and then found Ugaki's body in a crashed aircraft on the beach (p. 340). However, an LST with this number never existed, although the author may have meant LST-926. Thomas describes Ugaki's plan to "thwart the invasion of Okinawa in late March and early April" in order "to overwhelm American defenses with waves of Kikusuis ("floating cherry blossoms") (p. 332). Kikusui means floating chrysanthemums, not cherry blossoms. The first Kikusui operation did not occur until April 6, 1945. The author gives the kamikaze hit on the Indianapolis, Admiral Spruance's flagship, as an example of the damage caused by the Kikusui operations, but this attack happened on March 31. Moreover, Indianapolis was hit by a Hayabusa fighter from Tokunoshima Army Air Base, so Ugaki did not even command this Army aircraft. Thomas mentions tokko (body-slamming) attacks (p.183), but taiatari is the Japanese word for body-slamming, and tokko means special attack. He incorrectly describes Yukio Seki, commander of the first kamikaze unit, putting on his hachimaki (bandanna) while in flight (p. 205). Even though many Japanese pilots were assigned to kamikaze squadrons with no requests for volunteers, Thomas erroneously writes that they were all volunteers during the Battle of Okinawa (p. 332). Some statements in the book are unsupported speculation not usually found in a serious history. He writes about the long-range Ginga bomber attack on Ulithi, "Eleven of twenty-four planes reported engine problems (a reluctance to die was the more likely explanation)." No evidence whatsoever is provided of the reason for this "reluctance to die," and crews of seven Ginga bombers died in battle within two months after their planes had engine problems during the 10-hour flight to Ulithi. 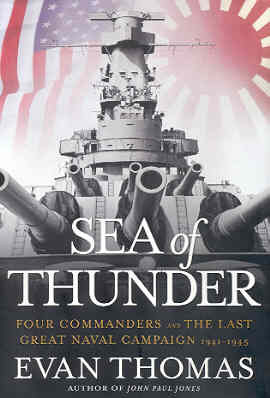 Sea of Thunder contains many interesting insights into the four commanders and the Battle of Leyte Gulf, but the inaccuracies, speculations, and unwarranted comments in the parts related to Matome Ugaki and Japan's kamikaze operations make it of limited value for these two topics. Ugaki's wartime diary, Fading Victory, provides a much better source to understand his personality and to obtain background on the kamikaze operations that he commanded from February 1945 to the end of the war.